Hello and happy Tuesday to all of our special Sassy Cheryl fans! You guys really loved Dawn's challenge last week with her photo inspiration. Thanks so much for playing along with us. and that's....Elizabeth. Congratulations and happy coloring Elizabeth! Please contact Sassy Cheryl to arrange for your $5 gift certificate to her store. For our challenge this week, our Sassy talented hostess Dawn has put together a sketch for us to follow. Sketches are always lots of fun and here's what Ms. Dawn has created. 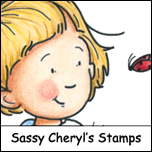 So grab your Sassy Cheryl image, coloring tools and craft supplies and join us. 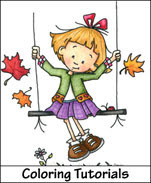 You might be the lucky winner of a $5.00 Gift Certificate to Sassy Cheryl's store. Wow. . . . Again, ladies. Simply incredible creations! These are such awesome cards. 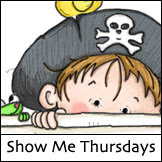 I havent' got time right now to leave some luv on all of your blogs, but know I'm sending it. I'm CASEing the graduation card. Another week of fabulous cards ladies!!! You are always such an inspiration. Congrats Elizabeth! Fun sketch, Dawn. Great samples, Ladies! Fantastic work by the DT AGAIN. :) I hope to play again! Fantastic creations ladies of the DT!! Thank you very much, that I've won this week. I'm very happy with it. I was crusin the gallery at scs and came across Dawn's card. Then I came over to sassy cheryl's challenge. Loved all the cards and decided to enter the challenge. Entering challenges is new to me. I had a fun time putting my card together! 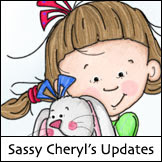 So sorry I did not use a sassy cheryl's image. Guess I can't join in the challenge after all. I did not notice this info untill I entered my card. Some challenges image does not have to be from the store site. Guess I need to read carefully before entering-Sorry Again! I did a card with Paint the Town. Fun image as she can be painting so much. I like the sketch and had to make a card. Gorgeous cards again this week ladies! Posting my card for this week's challenge! Crossing my fingers that I'm the random number!! OOPS...please delete my entry #11....hit wrong link. Sorry. Enjoyed this challenge. Thanks for letting me play again this week. :) Great job on all the cards ladies! Great sketch this week and the DT did a good job: fabulous cards. Great Sketch this week and the Design team has just rocked this challenge as always. Great Job everyone. A great sketch and i make the card and put him on my blog. Thank you ladies for all the wonderful comments on the DT cards and your participation! You guys ROCK! Whahoooo!! I got my card in time. LOL This sketch is the cutest!! !